These are some of the most regular big money itv.com competitions – Good Morning Britain, Lorraine, Loose Women & This Morning generally run every week or fortnight with some of the biggest competition prizes in the world (outside paid lotteries, instant win games & gambling!). Entering these contests & prize draws is like buying a lottery ticket – the prize might be a bit smaller than the National Lottery or Euromillions but the odds of winning are a lot bigger! 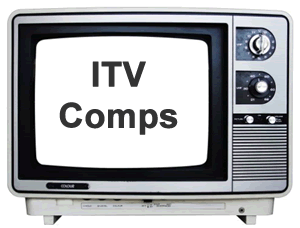 We keep you up to date with the latest ITV comps. If you want to win money, itv comps are the way to go. Whilst Good Morning Britain aka GMB (previously GMTV and Daybreak), Lorraine (the Lorraine competition is usually the same as the GMB competition), This Morning and LooseWomen are the regular providers of high quality itv.com competitions, there are many more which come and go seasonally. Usually there is one in the afternoon, such as Dickinsons Real Deal, Tipping Point and Tenable, and then a couple over the weekend; especially during the winter months there are loads of opportunities to win online prizes for free. Talent shows such as X Factor, Dancing on Ice & Britain’s Got Talent (BGT) attractive massive audiences and often have huge-mega-mungos prizes to the value of around £50,000. Then there’s light itv entertainment such as Take Me Out, quality gameshows Who Wants To Be A Millionaire, the awesome The Cube (here at QH, we really love The Cube!) and family favourites such as You’ve Been Framed & Family Fortunes. Oh, and we can’t forget I’m a Celebrity Get Me Out Of Here competition with Ant and Dec. The above are just some examples of shows that offer itv.com competitions – some may be out of date. All itv.com competitions tend to follow the same format, they are very easy to enter and open to UK residents over the age of 18 years old who have a telephone number & address. NOTE that in recent years ITV have changed their format and these are usually not free competitions; a fee must be paid to enter, with the exception of postal entries! We’ll keep you informed if there are any questions to answer! NOTE that the information below is for historical reference only and is now out of date. Back in the day, it was all about the telephone. Contestants were shortlisted to 10 who joined the show live on the phone. During an immensely exciting moment – as a child it really was very exciting, Lorraine Kelly would ask the computer to select a winner. And so the phrase “computer, pick a winner” was born. 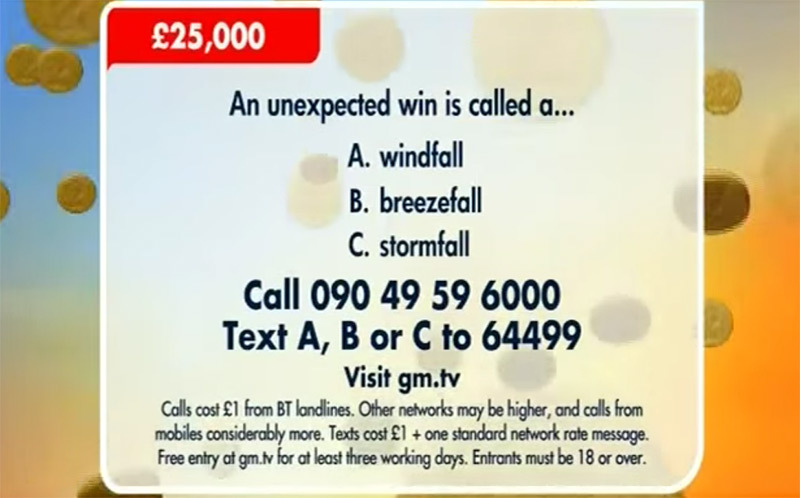 As such, the format changed in the late 90’s or early noughties, with the live “computer pick a winner” format ceased — telephone and postcard entry were the options. This was soon followed by premium rate sms and eventually online entry being introduced as a free alternative to the premium rate numbers. 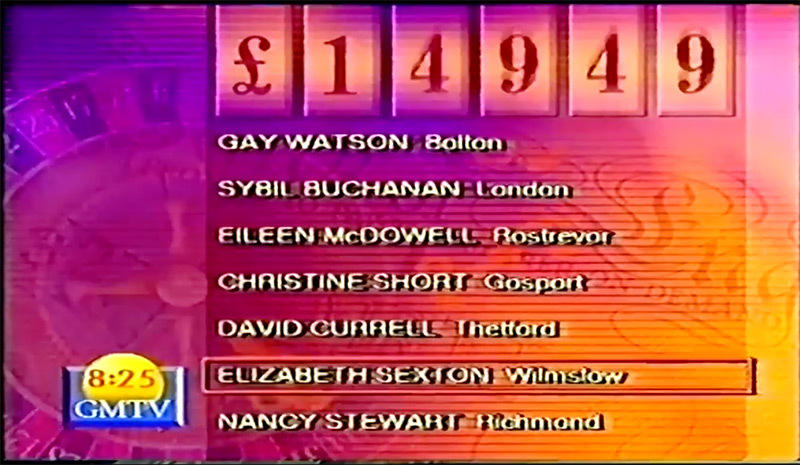 The only real “difficulty” in entering these earlier itv competitions was making sure you are watching the TV at the right time in order to get the question….because they did not publish the question on the itv.com website, nor did they repeat the question on the phone lines or online. Sometimes the competitions were ran as prize draws and there was no question/ answer. Similar to today, ITV competitions run for various lengths of times, ranging from a few days to a few weeks, there are no instant win games however they did publish lists of winners. The questions were always very easy and multiple choice A simple example would be What is the capital city of France? A) Paris B) London C) Dublin. The difficulty was rarely knowing the answer, but rather knowing the question! Basically, if you missed any of your favourite itv shows you would miss the question and you wouldn’t be able to answer for your chance to win money and great prizes. If this system ever returns, TVComp.UK will always make sure we share the question with you.